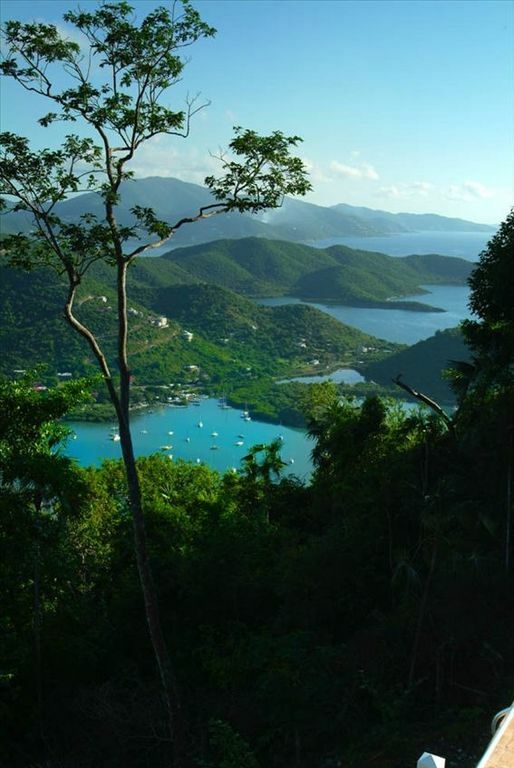 Coral Rays is a beautifully appointed four bedroom and four bathroom villa overlooking Coral Bay and views of Tortola. This house is perfect for a group as it offers a wonderful open concept with the great room and beautifully appointed kitchen upstairs, yet the house offers plenty of private spaces where you can get away from it all and just enjoy the peace and tranquility that is the true ambiance of St John. For those who like to bathe al fresco there are two beautiful outdoor open air showers of native stone that offer a unique and unforgettable experience. Private pool with a huge ten person jacuzzi where you can relax with your favorite tropical drink after a day at one our beautiful world renowned beaches, hiking, sailing, boating, shopping, etc. The Ray family (four siblings and three spouses) originally from Minnesota built Coral Rays after renting villas on St John since 1987. We originally came to the BVI on bare boat sailing trips and soon realized it was much more comfortable to rent a villa and go on day sails. We are a close family and would meet every year to vacation on St John. We currently live in Minnesota, Seattle, NYC and Atlanta. We came to appreciate different features from different villas and incorporated them into our design. We bought the land in 1997 and begun construction in early 2003 and finished eighteen months later in the fall of 2004. We designed two buildings so that bigger groups of friends and/or family could also enjoy privacy. We had stayed at many villas where you could not get away from each other and relax. Two of four of the bathrooms have outdoor showers which is a feature we have always loved (coming from Minnesota). The full gourmet kitchen in the upper great room features a large central granite island with 5-burner gas cook top and counter seating, ample granite counter workspaces throughout, convection-option oven, microwave, pantry, bar fridge. Separate beverage prep area features its own workspace, sink, fridge and ice maker. The barbeque grill is just outside the kitchen on a spacious deck with its own outdoor dining area. We thoroughly enjoyed our time at Coral Rays. The house is large and on several different levels so there is plenty of privacy if you need it (we were only there with our kids so not quite as important for us). The top floor is the main living area with a big kitchen with everything you need and a comfortable living room. There is a bathroom on this floor with a beautiful outdoor shower. The second level has two more large bedrooms and the pool and hot tub. We used the pool and hot tub daily. Bedrooms share a jack and jill bathroom. Third level down is an additional two bedrooms - one with kind and one with queen. The king bedroom also has a beautiful outdoor shower. Both have bathrooms. The house has all of the supplies you need which was a huge bonus (ie laundry detergent, paper toweling, dish soap, beach chairs, beach towels, bug spray, etc). The house is above Coral Bay and very close to most North shore beaches as well as Salt Pond (our favorite) and Lameshur. There are several grocery stores within a five minute drive. The house is up a giganticly huge hill (as most houses are in St. John) so you'll need four wheel drive. Coral Bay still has some work to do before it gets to look like a pre-hurricane area, but there are still several restaurants, etc open. We were the first to rent the property since the hurricanes last year. As a result there were a couple of issues upon our arrival, but the management team was VERY responsive in addressing them. This was particularly noteworthy since it was Christmas week that we were there. The great room is exactly that - great. The view is superb, the appliances, pots/pans, cutlery were what you would want and the bedrooms and beds were all comfortable and spacious enough. We were a party of 6 staying at Coral Rays and had 2-3 more family members staying at other places who would come over for dinner and board games in the evening. The space handled all of that with ease. The hot tub was a hit with some as well. It was great to do some laundry on a rainy day to avoid having to do that when we came home. As with any place with a view like this, do make sure you rent a 4-wheel drive vehicle. We loved the place and will definitely look it up the next time we go to St. John. Can't Wait to Go Back - AGAIN!! This our 5th time to going to St. John and our 4th time staying at Coral Rays (we didn't know any better the first time). Everything is always PERFECT while we're there. Coral Rays is our standard for other rentals elsewhere and honestly, we haven't found anything that beats it. The views are like none other. The pool is perfect. Everything in the house is top notch. We've been there with up to 10 people and as few as four. It is always comfortable - like home. I can't wait to get back there again - and we just got home this morning. There's NO PLACE I'd rather stay. Had the luxury of staying here with my wife's family, total of 8 people ages 72 to 6. Everything about the house is exactly as the other reviewers have said. Well-equipped cook's kitchen, great low key location, wonderful bedrooms and baths, spacious and open common area. Pool didn't get much sun in the week we were there, but the hot tub was a hit for everyone. However what really put this over the top was the exceptional service we received from Wayne and Roseanne, the new property managers. From the moment we met them near the property through our stay they provided wonderful service. They were prompt in answering our questions, offered spot-on suggestions for age appropriate activities and locations, made excellent dining recommendations and provided other insights into St. John. During our stay there was a power outage that affected the entire islands of St. Thomas and St. John. Roseanne was at our villa by nine that morning with ice for the coolers and information about the issue. I can honestly say that in our 13 years of experience with renting villas in the Caribbean which has included the islands of St. Barths, St. Maarten and Vieques, this was the best property manager experience ever. Had a family of 8 stay here. Ages 82 - 22 months. We all enjoyed this home. Away from the hustle of downtown. We visited a number of St. John beaches, hiked on trails, enjoyed Coral Bay and made the most of this well equipped home. My family spent Christmas together for the first time in years at Coral Ray. The view from the balcony was very beautiful and made for a relaxing time for all. Trunk Bay is one of the prettiest beach I have ever seen and the grandchildren enjoyed snorkeling for the first time. The property was exactly what was expected and it was great having such a large kitchen. I would highly recommend this villa to others.